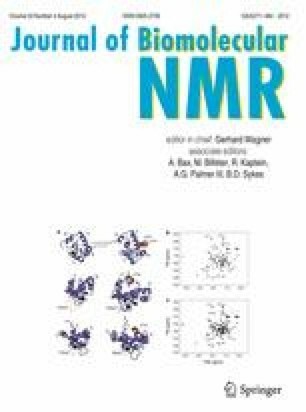 The J-UNIO (JCSG protocol using the software UNIO) procedure for automated protein structure determination by NMR in solution is introduced. In the present implementation, J-UNIO makes use of APSY-NMR spectroscopy, 3D heteronuclear-resolved [1H,1H]-NOESY experiments, and the software UNIO. Applications with proteins from the JCSG target list with sizes up to 150 residues showed that the procedure is highly robust and efficient. In all instances the correct polypeptide fold was obtained in the first round of automated data analysis and structure calculation. After interactive validation of the data obtained from the automated routine, the quality of the final structures was comparable to results from interactive structure determination. Special advantages are that the NMR data have been recorded with 6–10 days of instrument time per protein, that there is only a single step of chemical shift adjustments to relate the backbone signals in the APSY-NMR spectra with the corresponding backbone signals in the NOESY spectra, and that the NOE-based amino acid side chain chemical shift assignments are automatically focused on those residues that are heavily weighted in the structure calculation. The individual working steps of J-UNIO are illustrated with the structure determination of the protein YP_926445.1 from Shewanella amazonensis, and the results obtained with 17 JCSG targets are critically evaluated. Pedro Serrano and Bill Pedrini contributed equally to this work. The following financial support is acknowledged: Swiss National Science Foundation and ETH Zürich through the NCCR Structural Biology; Swiss National Science Foundation for a Fellowship to BP (PA00A–104097/1); NIH, National Institute of General Medical Services, Protein Structure Initiative, Grants U54 GM094586 and U54 GM074898 (the content is solely the responsibility of the authors and does not necessarily represent the official views of the National Institute of General Medical Science or the National Institutes of Health). KW is the Cecil H. and Ida M. Green Professor of Structural Biology at The Scripps Research Institute. Our validation strategy makes use of quantitative criteria to qualify the Structure V (Fig. 1), including the publically available tools Procheck (Laskowski et al. 1993), Verify3D (Lüthy et al. 1992) and the PDB validation suite. In-house threshold values for acceptance of the individual criteria (Table 1) were established based on past high-quality interactive protein structure determinations in our laboratory. Furthermore, some qualitative tools are used for initial checks of the final Structure V, in order to guide the spectroscopist during the early stages of the validation procedure, and additional tools are used to monitor the course of the automated structure determination. In the following we comment on the validation tools represented in Table 1, and then on the additional criteria. A first criterion considered in Table 1 enables an evaluation of the input for the protein structure calculation, i.e., we request that the number of long-range NOE constraints per residue must be higher than the threshold of five. In our experience, satisfying this sole criterion is sufficient to document that nearly complete chemical shift assignments have been obtained and that there is also a dense network of sequential and medium-range NOE distance constraints, thus qualifying an input for the structure calculation that is of high overall quality. A second group of criteria is used to document acceptable convergence of the structure calculation, with small residual violations of the experimental input data and small distortions of the covalent structure geometry. These are the residual target function value, the number of residual NOE distance constraint violations, the number of residual dihedral angle violations, and the RMSD from standard covalent structure geometry. In a third group of criteria, the precision of the Structure V (Fig. 1) is characterized by RMSDs to the mean coordinates of the bundle of conformers (Fig. 4b) calculated for the backbone heavy atoms and all heavy atoms, respectively. In addition, we introduce the “core precision” as the all-heavy-atom RMSD calculated for all the residues with solvent accessibility below 15 %. Initial experience with this parameter indicates that it is useful for comparison of the core packing in different protein structure types. The overall quality of the Structure V is monitored also by the PROCHECK global quality score, the Verify3D raw score, and the side chain planarity Z-score, with the acceptance threshold values listed in Table 1. In addition, a structure is accepted only if all criteria of the PDB validation suite are satisfied. Additional qualitative criteria for structure validation are used to directly assess the agreement between selected raw experimental NMR data and corresponding data derived from the Structure V bundle of conformers (Fig. 4b). First, comparison of the structure-derived and the observed ring current shifts provides qualitative checks on possible local errors in amino acid side chain arrangements. The Fig. 5 shows a plot of the observed methyl hydrogen ring current shifts (RCSobs) versus the corresponding ring current shifts calculated from the atomic coordinates of the NMR structure (RCSpre) for the protein YP_926445.1. Prior to structure validation with the tools listed in Table 1, methyl groups with entries located far from the diagonal in this presentation would be singled out for further interactive analysis until a satisfactory fit is attained, or a rationale is found to explain the apparent discrepancy. Second, comparison of the regular secondary structures in Structure V and those predicted from the 13Cα and 13Cβ chemical shift values (Fig. 6) afford a check of the agreement between experimental NMR data for the polypeptide backbone and the final Structure V (Wishart and Sykes 1994), and the same applies to analysis of the agreement between experimental patterns of sequential and medium-range 1H–1H-NOEs and the locations of regular secondary structures in Structure V (Fig. 7) (Wüthrich 1986). Similar to the aforementioned handling of the ring current shift data, apparent discrepancies between the locations of regular secondary structures, the corresponding 13Cα and 13Cβ chemical shift values and/or the NOE patterns are followed up prior to the structure validation reported in Table 1. The Table 3 lists the three principal criteria that we use to monitor the course of the calculation of Structure V with the software UNIO-ATNOS/CANDID and the simulated annealing routine of CYANA (for the initial round of calculations which result in Structure A, we only evaluate the final result obtained after cycle 7 (Herrmann et al. 2002a), since the criteria of Table 3 would be dominantly affected by the obvious limitations of the input used, as is described in the main text). The CYANA target function value must be below the threshold of 300 Å2 after the first cycle, should then monotonously adopt smaller values after cycles 2–6, and be below the threshold of 10 Å2 after cycle 7. The percentage of covalent NOEs assigned (Herrmann et al. 2002b) is automatically recorded by the ATNOS module in UNIO-ATNOS/CANDID. Obtaining high completeness of these “covalent assignments” assures robustness of the 1H–1H-NOE-based approach used by J-UNIO. Finally, checking the extent to which the NOE cross peaks in the three NOESY data sets (Fig. 1) have been assigned serves primarily to evaluate the success of the effort made for the interactive completion of the assignments from the automated routines. Rationales for choosing the rather permissible threshold of <20 % are given in the main text.